The new season is upon us and the weather and trees will soon be following suit. If you haven’t gotten your wardrobe in order for cooler weather, now’s the time to do it when new inventory is at its peak. So what trends should you consider? While it’s important to stay current with fashion – especially in business, where an outdated wardrobe implies an outdated skill set – it’s also important to edit when it comes to trends. Don’t follow every new thing. Pick the ones that suit you best and pass on all the rest. In a perfect wardrobe, you would have your classic “work horse” pieces that are of good quality that you wear for years, that you then mix and match with various trends to keep things fresh and current. Invest in staples and go cheap on trends. That’s the best way to get the most for your money. So what’s hot for Fall 2015? While cold weather favorites and the 1970s were the predominant catwalk themes for Fall Fashion 2015, designers also referenced movies, Victorian times, and the Far East. So whatever your fashion fancy, you have plenty to choose from. Black and white are perennial favorites because they can mix and match with so many other things. Opt for classic silhouettes that go with each other and that can serve as a backdrop for your trendier pieces. “Fifty Shades of Grey” launched a movie…and a clothing color trend. You’ll find it all over the place this year, from casual wear to cocktail attire. Go monochrome or mix and match with jewel tones for a rich, cool-weather vibe. If you grew up in the 70s, you’re familiar with the orange, avocado, and brown tones of the decade. That palette is back in a big way this fall, so if you have yellow undertones, you’re going to love these colors. Speaking of 1970s, the floppy bow makes a comeback in numbers not seen since the Carter administration. It’s a great way to add a dash of femininity to your work wardrobe and draw attention to your face. Culottes are as hot this year as they were when Mork and Mindy debuted back in 1978. Since this is a non-traditional length and silhouette, be sure they meet your business dress code before wearing them to work. Also consider the rules of proportion, particularly if you’re petite. The Boho trend has lingered for several years, in part because of Rachel Zoe’s affinity for the early 70s. If this look calls to your inner Flower Child, just remember to keep it business appropriate, and always remember your audience. Boho doesn’t fly in traditional industries like banking. Here’s another trend that’s been around for a couple of seasons, but it’s particularly popular this fall. You’ll find it on everything from handbags to outerwear at price points from high to low. Like ruffles and lace? Corsets and ribbons? You’re going to love this trend. High neck blouses are particularly popular, as are capes and long skirts. Just keep it office-appropriate at work to keep the focus on your business. Big prints are big this season, from traditional plaids and window pane prints to over-the-top designs. Remember the wallpaper in your grandmother’s dining room or the pattern on her sofa? So did many designers, and they put them on their clothes this year. Just be careful to scale the print size to your body size everything’s in proportion. The west has had a fascination with the east since Silk Road times, and it continues this season with a vast array of Chinoiserie, including silk, Mandarin collars, and dragon motifs. Did you know? The word Chinoiserie (pronounced shen wäzere) is French for “Chinese-esque,” and refers to Chinese motifs in Western art, clothing, furniture, and architecture. It was especially popular in Europe in the late 18th century. Which trends appeal to you? Which ones don’t? Remember, you don’t have to partake of every trend, but you should add at least a few pieces each season to look current and on point. Updating your wardrobe implies that you’re current with your skill set, whereas wearing the “same old, same old,” implies that you’re not. You don’t want that. So add a few new items this fall. As you can see, there’s lots to choose from. I love the black and white! It never really goes out of style and I prefer a classic look. Thanks for keeping us updated Diana. You’re welcome, Renee! Glad you like it. Diana, for the past three Fall seasons I have been seeing patent as a Fall/Winter shoe. This is really bugging me because instinctually it seems warm weather. Is this a passing trend or the new normal? For generations, patent leather was only worn in spring and summer. It came out Easter weekend and was put away at Labor Day. But in recent years, it has become more acceptable to wear year ’round. Still, if you’re not comfortable with that, just wear it for warm weather and make suede your cool weather leather of choice. Thank you for taking the time to show us things like this. I always take away something new which I can use. I recently got a new job (with a raise), and am using your tips more than ever. One of the things I learned on my own (from trying oh, so many styles and evaluating the results) are that large collars just don’t look good on me (short neck, broad shoulders, small stature), and I love Mandarin collars. They are difficult to find, though. I’m encouraged that they are trending back into style. And lace — my inner Victorian is rejoicing at all the lace lately! A word on a few of the trends: If you are of a certain age, be very careful in going boho, wearing fringe, etc. Adding a tad of those trends can make one look updated and current. Adding too many of those trends can make a woman of who came of age in the 70’s look like a silly aging re-tread hippie who still lives on her memories of Woodstock. Yuck! No thanks! As to grey: I look ill in most greys. I do love the autumn palette, though. I am one of the ‘autumns’ from the color seasons thing that was popular in the 80’s or 90’s. Mel810, you’re absolutely right! 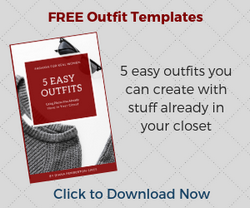 Wearing too much of ANY trend can make you look silly, so easy does it. As for the colors – choose what works best on you and pass on all the rest. I am going on the hunt for an Eastern inspired cut, black and white blouse or jacket. As for the earth tones, fringe and floppy bow, been there, done that. For me those fall under the heading of if you wore it the first time it was fashionable, you are probably too old to wear it the second time it comes around. Janet – LOL on the “been there, done that” trends. Some are more timeless than others and can be worn any time they come back around, but of course, do what suits you best. 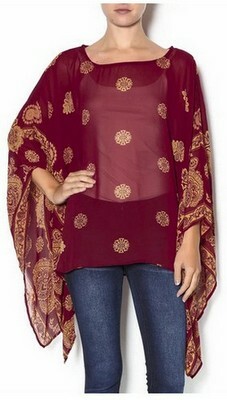 An Asian-inspired blouse or jacket sounds fabulous!